This Week’s Question: Why Are Planets Round? The planets in our solar system are different in a lot of ways. But one thing they all have in common is shape! What makes planets shaped like a sphere, instead of cube, pyramid or disc? This story from NASA’s Space Place has the scoop! Geodesy is the science of measuring Earth’s shape, gravity and rotation to provide accurate measurements. It’s how we know Earth is shaped like a sphere, though not a perfect one. Watch “Looking Down a Well: A Brief History of Geodesy” to learn more! **NEW** Send Your Name to Mars on NASA’s Next Red Planet Mission! The American Geosciences Institute is sponsoring a series of contests to celebrate Earth Science Week 2017. This year’s celebration takes place Oct. 8-14, 2017. Humans interact with the planet’s natural systems in many ways. With a camera, capture evidence of some ways people affect, or are affected by, Earth systems around your home, neighborhood, school, workplace, or local public spaces. In a photo, show human interaction with natural systems where you are. The natural world is part of many things that people do. Think of where our food, clothes and homes come from. Think of the forces that shape our weather, our travels, our habits and all the things we can (and cannot) do. Create a picture that shows how human activities shape, and are shaped by, Earth systems. Earth science expands our understanding of human interaction with the planet’s natural systems and processes. Geoscientists explore the relationship between human activity and Earth’s systems. The impact of their research can be seen in areas such as energy, technology, climate change, the environment, natural disasters, industry, agriculture and tourism. Focusing on one topic, explain how geoscience helps us make the most of opportunities and manage challenges. Explore the relationship between human activity and Earth systems, including the geosphere (earth), hydrosphere (water), atmosphere (air) and biosphere (life). Submit a brief, 30-90 second original video that tells viewers about how people have an impact on Earth systems, or how Earth systems have an impact on people, in your part of the world. The entry deadline for all four contests is Oct. 13, 2017. Visit the contest websites for full details. California has highly variable annual precipitation and a great disparity between where precipitation falls and where people live and grow crops. To deal with these issues, a vast array of infrastructure is in place. Monitoring and maintaining this infrastructure is critical. Join Dr. Cathleen E. Jones, a signals analysis engineer, for a discussion about how NASA is using high-resolution, airborne radar to make this monitoring more efficient. Researchers Kip Thorne and Barry Barish of Caltech and Rainer Weiss of MIT have been awarded the 2017 Nobel Prize in Physics for their “decisive contributions to the LIGO detector and the observation of gravitational waves.” To learn more about the Laser Interferometer Gravitational-Wave Observatory and ways to bring its scientific breakthroughs into the classroom, visit https://www.jpl.nasa.gov/edu/news/2016/3/23/modeling-gravitational-waves/. The NASA Astrobiology Institute has funded the production of an exciting new online educational game for 7th- and 8th-grade classrooms called “Life Underground.” In the interactive experience, the student takes on the role of a young scientist who navigates and investigates a subsurface environment, searching for and characterizing microbial life. The project’s development team at the University of Southern California’s School of Cinematic Arts is seeking teacher reviewers for the game. Reviewers are asked to spend an hour or so exploring the software and reviewing the accompanying supplemental materials. To learn more, fill out the brief interest survey found at https://www.surveymonkey.com/r/midschoolsoftware. Please direct questions about this opportunity to Daniella Scalice at daniella.m.scalice@nasa.gov. A notice of intent is requested by Oct. 13, 2017. Project plans are due Nov. 16, 2017. This Week’s Question: What Is the Parker Solar Probe? NASA’s Parker Solar Probe will be the first spacecraft to “touch the sun.” Find out more about this daredevil mission and how it will help us to better understand our star. Play the “Helios” game from NASA’s Space Place! Learn how the sun creates energy by combining protons and neutrons in just the right way to make helium and release energy. Check it out at https://spaceplace.nasa.gov/helios-game/en/. To learn more, visit http://observethemoonnight.org/. Please direct questions about this opportunity to https://eclipse2017.nasa.gov/contact-us. To learn more, visit https://docs.google.com/forms/d/e/1FAIpQLSflUo52KHfe-PLTEUli-FDRIDG7FtZ51sbtMMpLUxzqL-qdGQ/viewform. This Week’s Question: Why Did the OSIRIS-REx Spacecraft Fly by Earth Last Week? The OSIRIS-REx spacecraft is on a mission to visit the asteroid Bennu and return a piece of it to Earth. The spacecraft is set to rendezvous with Bennu in August 2018, so why did it fly by Earth on Sept. 22? To find out, visit https://www.nasa.gov/feature/goddard/2017/osiris-rex-spacecraft-slingshots-past-earth. Want to learn more about OSIRIS-REx and Asteroid Bennu? Check out the 321Science! Video Series to learn about asteroid science and details about the mission. The Arizona State University Infiniscope Project (under cooperative agreement with NASA’s Science Mission Directorate) aims to recruit individuals with enthusiasm and ambition for a renewable, one-year term from 2017-2018 on its advisory board. Board members will review Infiniscope-developed educational products and receive a stipend, training, collaborative space, and recognition on the Infiniscope website. Board members also will have opportunities to earn badges and attend group meet-ups at national conventions. For more information, visit https://infiniscope.org/announcements/educator-advisory-board-application/. Please direct questions about this opportunity to Jessica Swann at jlswann@asu.edu. This Week’s Question: What Will This Year’s Perseid Meteor Shower Be Like? August 2017 is a big month for astronomy! In addition to the solar eclipse on Aug. 21, the Perseid meteor shower is set to peak on Aug. 11-13, 2017. Find out what to expect from this year’s event in this blog post from NASA meteor expert Bill Cooke. And to learn more about the Perseid meteor shower and the solar eclipse, check out the newest episode of ScienceCast at https://science.nasa.gov/science-news/sciencecasts/big-month-for-astronomy. NASA is on the hunt for a new Planetary Protection Officer, and space fans of all ages are excited about the position. Nine-year-old Jack Davis “applied” for the job, and NASA’s science team was quick to respond. Less Than TWO WEEKS Until the Total Solar Eclipse! As excitement for the total solar eclipse builds, be sure you know what to expect on the big day! Get the “Who? What? Where? When? and How?” before the eclipse on Aug. 21! On Aug. 10, 2016, the first Science WOW! message was sent to 953 subscribers. Since that date, NASA’s science experts found distant worlds, shared views from space probes that zoomed near Saturn and Jupiter, and launched satellites that help us better understand our home planet. And the number of Science WOW! subscribers multiplied to near 7,000! NASA’s STEM Science Activation team wants to thank YOU for being a part of our first year of Science WOW! We hope you have enjoyed learning answers to the “Question of the Week” and exploring the “Have You Seen” items featured each week. And we can’t wait to share more science and learning opportunities with you in the many years to follow. How can we improve sharing the science? Please send your feedback to https://science.nasa.gov/about-us/contact-us. On Aug. 21, 2017, North America will be treated to a solar eclipse. Native Americans have been observing natural events such as eclipses for thousands of years. Join the ESTEEM team on Aug. 10, 2017, at 4 p.m. EDT, as we preview materials, answer science questions, and allow for dialogue related to Native American knowledge about the eclipse. What is actually happening to the sun during an eclipse? What Tribal traditions take place in our region? Discover how to bring the eclipse to life through the lens of a Native American perspective. For more information, visit https://www.nasa.gov/dln/live. Please direct questions about this event to Bonnie Murray at bonnie.murray@nasa.gov. Potentially, more than 300 million people in the United States could directly view the Aug. 21 total solar eclipse, and NASA wants everyone who witnesses the eclipse to do so safely. Looking at the sun with the naked eye is unsafe, but with special solar filters, such as eclipse glasses or a handheld solar viewer, you can safely look directly at the sun. Learn how to check the safety authenticity of viewing glasses or find out how to observe the eclipse with alternate methods. For tips to safely view the solar eclipse, visit https://eclipse2017.nasa.gov/safety. Please send questions about the solar eclipse to https://eclipse2017.nasa.gov/contact-us. Join NASA’s Digital Learning Network for a two-hour solar eclipse extravaganza! Tune in to see the eclipse live from within the path of totality and learn about the science of the sun-Earth-moon system. Watch CricketCam and make predictions. Find out how to get involved in NASA opportunities. Ask NASA experts your questions via Twitter @NASADLN using #askDLN or by email at DLiNfochannel@gmail.com. For more information about this event, visit https://www.nasa.gov/dln/live. Earth is solar-powered. So what happens when the sun’s light is blocked, even temporarily? If you measure air temperature and cloud changes, how cool is the eclipse? To learn more, visit https://observer.globe.gov/eclipse2017. Find everything you need to know about viewing the upcoming solar eclipse with pre-K and Kindergarten students. Watch a short video that explains the science behind solar eclipses in language and graphics designed specifically for young learners. Young explorers can view a U.S. map that illustrates the path of totality, and do a hands-on eclipse activity. To learn more, visit https://augusteclipse.com/. All materials were developed in conjunction with The U.S. Space & Rocket Center and the Oregon Museum of Science and Industry. Please direct questions about these materials to info@spaceracers.org. 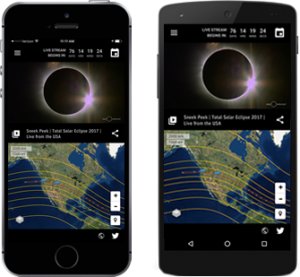 Introduce your students and informal audiences to an entirely new type of learning experience with “Eclipse 2017” from NASA and Infiniscope. Aligned with the Next Generation Science Standards, the experience presents NASA’s “Eyes on the Solar System” visualization embedded within the immersive digital learning environment of Infiniscope. Learners will explore the Earth-moon-sun system; learn about shadows at the astronomical level; and predict the eclipse’s path of totality. For more information, visit https://infiniscope.education/lesson/eclipse-2017/. Please direct questions about this resource to Jessica Swann at jlswann@asu.edu. NASA’s Digital Learning Network is looking for museums and other educational institutions to host a live virtual event in conjunction with the total solar eclipse on Aug. 21, 2017. Host venues will connect with NASA for a two-hour solar eclipse extravaganza. A limited number of sites will be selected to participate in the LIVE event, and participants will ask questions of our experts directly. All sites must register and complete a technical test no later than Aug. 10, 2017. For more information, visit http://bit.ly/DLN_E-Day. Please direct questions about this opportunity to DLiNfochannel@gmail.com.